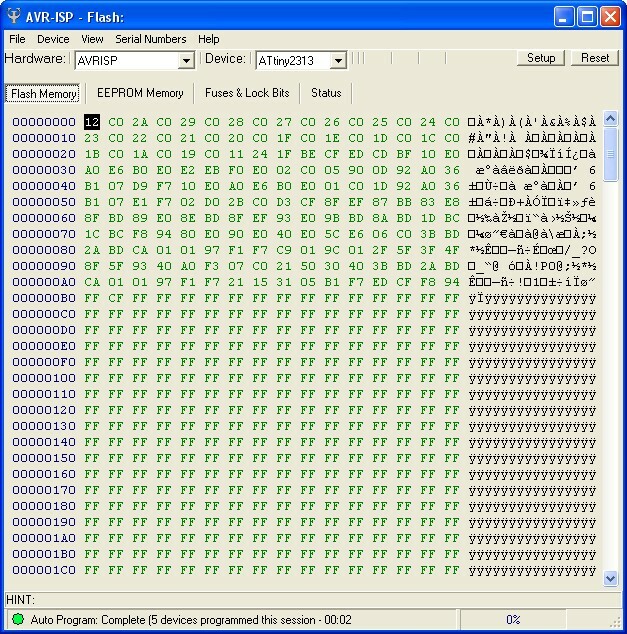 December 5, 2008 by rwb, under Microcontroller. On the figure 1A the motor is controlled by applying continues current through transistor base lead and this will cause the continues current flow through transistor’s collector lead by the factor of transistor’s gain (Ic = gain x Ib); the more current we put on the transistor’s base lead the more current Ic will flow through the transistor’s collector lead; this also mean the motor speed is depend on the current we put on transistor’s base lead. Using this kind of method, make the transistor always in the working stage and as a result the power dissipation (power lost as heat) on the transistor become very high. On the other circuit figure 1B the motor is controlled by applying pulse current through the transistor’s base lead and this will cause the Ic pulse current flow through transistor’s collector lead. 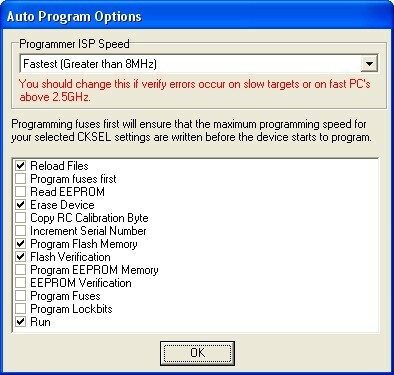 By varying the pulse width and using the right frequency, we could control the motor speed. Using the pulse current make the transistor on and off very quickly, this will reduce much of the power dissipation on the transistor. This kind of method is known as pulse width modulation or PWM for short. The disadvantage of using the PWM method is the electronics circuit to produce this signal tend to be complex, but thanks to today’s technology; even the most cheapest and tiny microcontroller such as AVR Tiny13 (only have 8 pins) could produce this PWM easily. For the purpose of this tutorial I will use Atmel AVR Tiny2313 microcontroller for playing with the PWM, but you could apply the principal to almost all AVR microcontroller family. 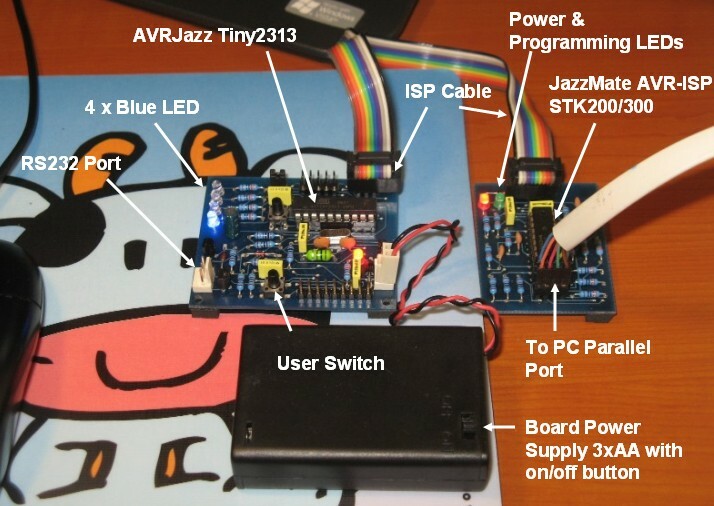 The AVRJazz Tiny2313 has four LEDs attached to the PORT B0 through PORT B3 and we will use the LED on PORT B3 for outputting the PWM signal. Ok let’s start the coding now ! From the diagram above the PWM setting is in the two timer counter registers TCCR0A and TCCR0B. 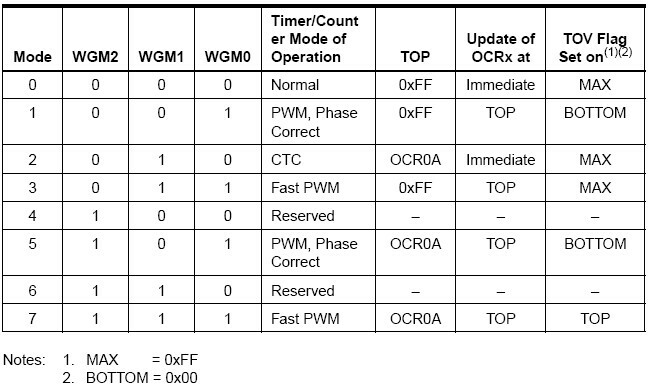 We choose the Fast PWM mode by assigning the WGM02 = 0 bit in TCCR0B register and WGM01 = 1, WGM00 = 1 bits in TCCR0A register. The TCNT0 register is where the actual counter run; it starts from 0 and count up to 255 and back to 0 again. The counting speed in TCNT0 register is depends on the system clock and the prescale factor we choose. For example if we have the system clock of 11059200 Hz and we use 1024 as the prescale factor (CS02=1, CS01=0, CS00=1) then the TCNT0 register will count every 1 / (11059200/1024) second or 0.0925 millisecond. 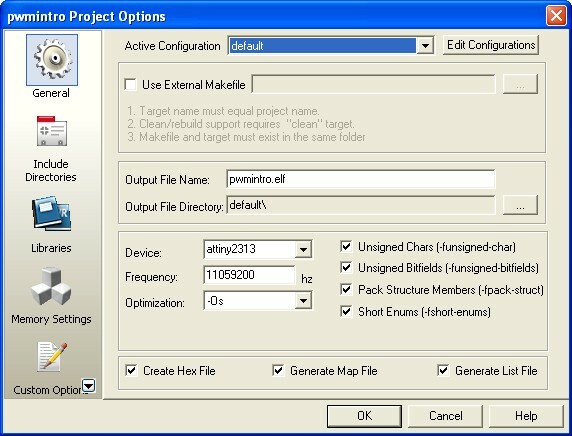 On this tutorial we use prescale factor of 1 (CS02=0, CS01=0 and CS00=1). Every time TCNT0 register value equal to OCR0A register value then the comparator will signal the waveform generator to clear the OC0A output; but every time the TCNT0 register value reach TOP (i.e. 255) then the waveform generator will set the OC0A output. Frequency output = 11059200 / 256 = 43200 Hz. This frequency is above the human hearing threshold which is 20000 Hz. Usually for controlling the high efficient DC motor such as walkman’s cassette motor we could use the PWM frequency above 20000 Hz but for low efficient motor such as children’s toy motor we use frequency below 100 Hz; but again you could experiment with it by changing the precale factor and see the result. By changing the COM0A1=1 and COM0A2=1 on the TCCR0A register we could toggle the OC0A output; on this tutorial we use COM0A1=1 and COM0A0=0. 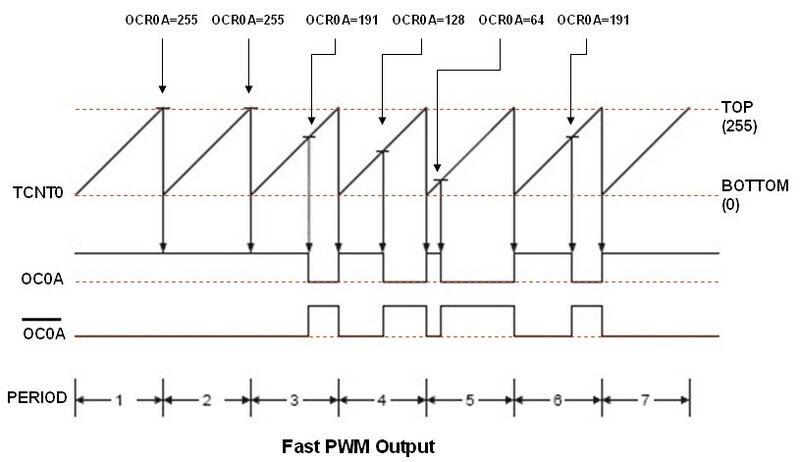 From here you could learn how easy to create the PWM using the microcontroller; first we set the microcontroller in Fast PWM mode by setting the TCCR0A and TCCR0B registers than second we just changing the value of OCR0A register from 0 to 255. Referring to the code example above; we simply use the PWM for dimming the LED from dark to bright and to dark again using two while loop statement; of course you could change the LED with DC motor by using a proper interface; on my next tutorial I will show how to interface the DC motor using the transistors.